Do you have a tablet or touch screen with Windows 8? Looking to zip around the screen using your favorite Office application like they do in the commercials? If yes, check out the new animated Office 2013 Touch Guide and learn just how easy it is to be productive on a touch device. The touch guide starts by illustrating the basics, like zoom in and out, scroll, show keyboard, then covers how to manipulate shapes, objects, and text. The guide is animated (the hand pictured moves), so it’s easy to mimic the gestures. 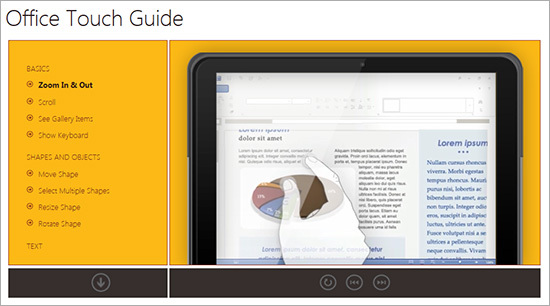 For Excel and PowerPoint fans, the guide goes on to cover tips specific to those applications. Spend a couple minutes with the Office Touch Guide and you’ll be well on your way to making the most of the Office products on your touch device.